We Survived P5 Term 1, YAY! Some of you have read in my facebook page about the amount of school work we have been dealing with since the start of this year, here's what been keeping the whole family on the toes with no chance of relaxing. I wasn't joking when I told a friend that it sure feels like WE are going to school instead of the boy. We have been warned by friends and DinoBoy's P4 teachers that there will be a huge difference between P4 and P5, like the content of subjects will be more in depth and requires more analyzing and logical thinking. One of the "known" set back that was highlighted to all P5-to-be-parents is that some students who fared well in previous years may find themselves getting red marks in certain subject(s) during the CA1 (Continual Assessment 1). Well, knowing this and actually be the "unlucky one" at the receiving end will still strike both parent and child, hard in some cases. 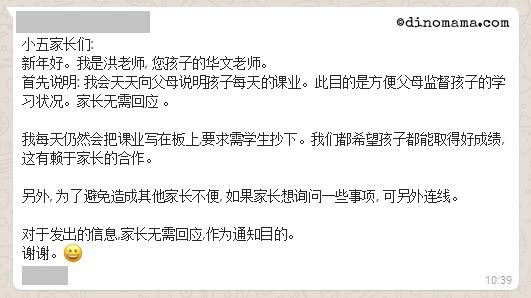 DinoBoy has always been a Band 2 student for most of his subjects, which is perfectly fine with us, we are not worried about his schoolwork so long he don't flunk the subject, we thought we could stay relaxed for this year but OH~ NOOO~~~ the school would not let us have that luxury. "Ok lah, the teacher said no need to reply so I probably don't need to pay much attention to it" I thought. Wrong again! 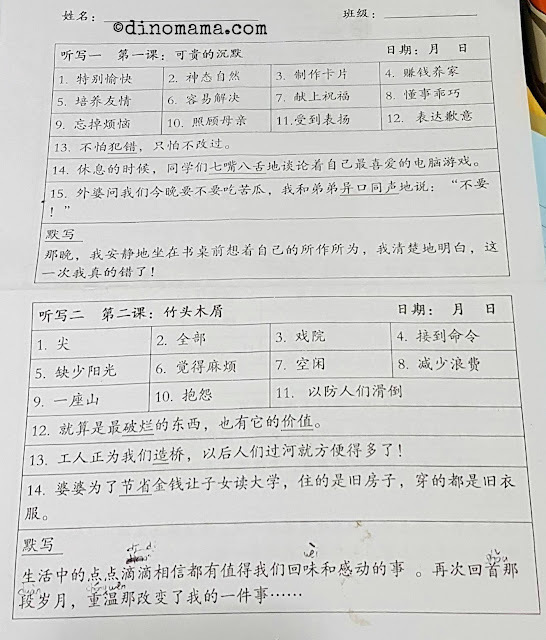 Everyday, from Monday to Friday at around 11am I will hear the familiar WhatsApp notification sound telling me that MTL teacher had just texted us, listing out the homework that she has given out to the kids AND which student forgot to bring which study material or who has not handed in his/her homework. 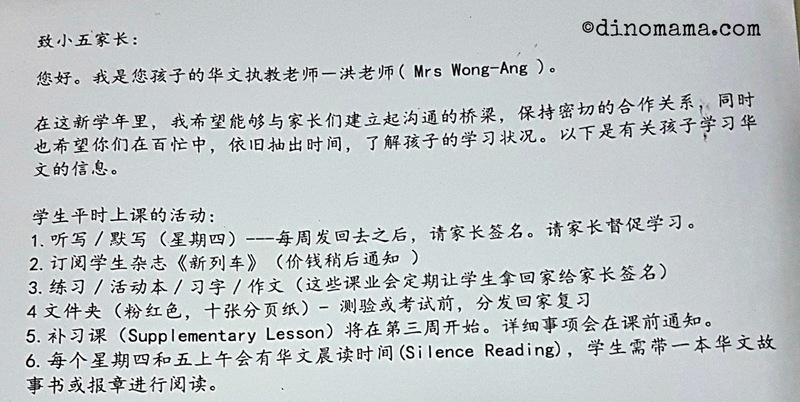 Later I learned that this teacher is the Head of Department - Mother Tongue Language, Ah~ no wonder she is micro managing the students! I guess as the HOD you have to ensure that the MTL results are always good with no chance of falling near or worse, below last year's result. And as Chinese is a challenging language to most students, extra efforts have to be put in to ensure that the students does not fail and pull down the school's overall Chinese standard are being pushed to show their utmost potential and score great marks during the exams. Having said that, I have come to appreciate the teacher's effort as the weeks goes by. Her daily message(s) made me check on DinoBoy's homework and coach him when he made a mistake. Also, last month DinoBoy suddenly started to converse with me in Mandarin! I was curious at this sudden change and I asked him, of course he said he "wanted to start using the language so that he can improve it." but a check with the teacher revealed that she was the one who threw the challenge to him so as to improve his Chinese and he took it up. Frankly, what's not to like about such a passionate teacher? Spelling has "evolved" into something that I would roll my eyes at every time I look at them. Instead of words, now they have short phrases or idioms and short sentences WITH dictation (the asterisk in the English list is the dictation). English spelling has always been "chicken feet" to DinoBoy, thanks to the phonics he learned during his kindergarten days. The amazing thing is that he only need to take a look at the list, 15 mins later and it is done. We can keep the list and go forward to do other stuffs. On the other hand with Chinese spelling, it is more challenging, the list has to be tackled according to the sections and learn on separate days. The hardest part is to memorize dictation, which always causes distress to DinoBoy, sometimes he is so tired after a long day in school that his brain shuts down when he is home. On such days we have to skip learning till the next day, luckily we always managed to get it done a day before the actual spelling day. Out of the 5 days week, DinoBoy is only able to come home early on ONE day around 1.45pm coz school ends at 1.30pm. Other days will be occupied with 2 days of supplementary classes, CCA on 1 day and as he is in the school team it means another day for the team to train for performances and competitions. Even though it has always been like this since P2 but this year, the classroom activities and learning has increased significantly, by the time he reaches home after the supplementary classes and CCA he had already spent 9 hours in school! I mean, he is seriously mentally and physically drained! According to DinoPapa, DinoBoy will laze on the sofa for as long as 30 mins before heading off to shower. In case you are wondering, no rest for him after that too! 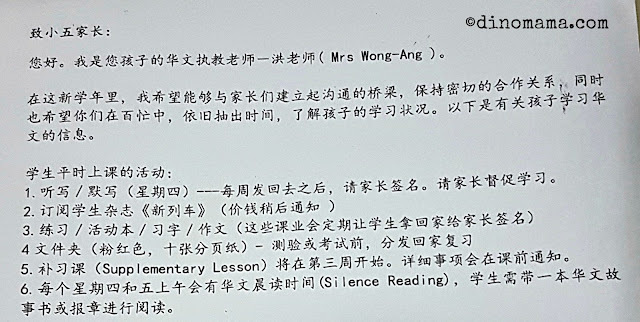 Now, the reason why we are breathing down his neck on Chinese spelling is because the teacher will keep students back after school to test spelling again if they fail badly during the actual test. Sometimes she will get those students who did not do their corrections or hand in their homework despite numerous reminders to stay back too. Seeing how tired he is every day, we didn't want DinoBoy to stay in the school any longer than required thus we have to take part of responsibility to ensure that such thing will not happen. 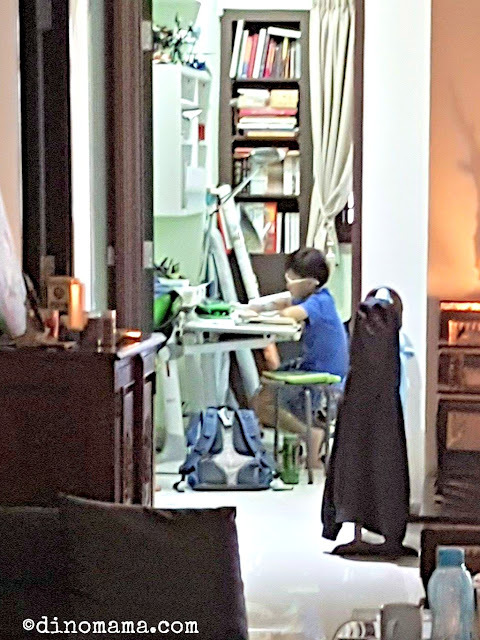 When I reached home around 630pm, this is the scene I will see almost every weekday as I open the gate - DinoBoy sitting at his study table trying to finish up the mountain of homework, 1.5 hours after he sat down at the table. How much homework exactly does he have daily? Well, from the MTL chat group WhatsApp screenshot I shared above, you know that he has Chinese homework daily without fail, so far he does not have Science homework and very minimum for English but a fair bit for Maths. 2 subjects, should be manageable right? WRONG! The Chinese teacher assigned at least 2 home work daily; either copying phrase or words they learned from textbook, or 3-4 pages from workbook, or from the magazine 新列车. Maths home work is at least 5 pages of worksheets that require detailed working such as problem sums; sorry no MCQ homework for them. On the average its 4 pages of work for both subjects that requires reading, understanding and writing, that can take up to 2 hours easily! And on days where DinoBoy does not know how to do the homework, he has to wait till after dinner before I can sit down with him to go through them. THEN there are days like this which makes me lose any tiny bit of faith with our education system. How is it productive or beneficial to a child who has to do so many home work, sometimes late into the night AND yet be able to get ample rest for the mind and body so that they are ready for the next day's challenge? Mind you, this is DinoBoy, who is not attending any enrichment class nor tuition so he has the whole later half of the afternoon free to do his homework. And yet, time is still not enough! I shudder to think about those kids who have to go for tuition on weekdays and the struggle they are going through to manage both school and tuition work. Well, ranting, stomping of feet, tearing or pulling out of hair aside, let's face it, the situation is as what it is and we cannot change anything except to adapt and conquer. I have learned to make some changes on the expectations for both DinoBoy and myself, I understand that there is no way he could withstand the amount of work load without having us to support him both physically and emotionally. One major concern that I wish to highlight here is Stress. Kids handle stress in their own unique way and as a parent we really have to keep a close watch on our kids to catch any little thing that shows that they are under too much stress and pressure. DinoBoy has a high level of stress endurance but he needs to release them eventually and the last time he did a year ago, it was explosive. The teacher was giving out home work when he suddenly screamed in class, keep repeating that he has "no time to do homework and assessment!". He totally lost it and was unconscionable. A scary image formed in my mind while the teacher recounted the whole incident to me over the phone, imagine what the teacher faced at that moment? It would be a traumatized incident for both the teacher and the classmates! That same thing happened within the first month of P5, we were just glad that it happened at home instead of in school. We allowed him to go through the whole process of releasing his anger and pent up frustration, allowed him to bawl his eyes out for as long as he needed. After he had calmed down, we managed to talk about his feelings and emotions, sorted out how best to deal with the school work. Most importantly I told him that "We will always be here to help and support you." There are a couple of things that irks and exasperates me! Despite numerous effort to ensure things goes well smoothly, it simply just did not! DinoBoy did not write down his homework for that day in his Student's Comm Book, resulting in him forgetting to do them or only remember it just before bedtime. It wasn't entirely his fault, it's because he has to shuttle between classes for different subjects so once the lesson is up every one's busy packing and scampering to the next classroom. Solution - Pagemarkers to the rescue! After seeking advise from friends I decided to try the pagemarkers. I bought a big pack from Daiso and put them in his pencil case so that he could simply just stick one onto the homework page. The vibrant color makes it difficult to miss out while unpacking the bag. 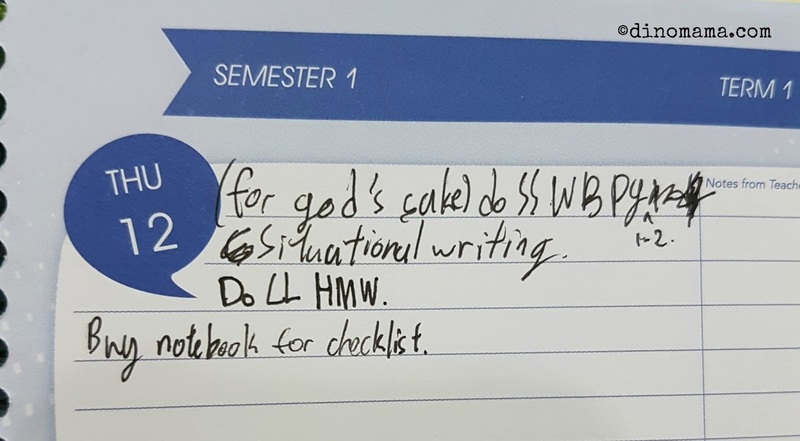 We only started to use this method 2 weeks before school term break, it seems to be working at that time but I think it takes time for DinoBoy to cultivate the habit of sticking them BEFORE rushing off to the next class. DinoBoy's verdict - "its a GREAT IDEA!" P5 is a crucial year, a preparation year for next year's PSLE or Primary School Leaving Examination, I have bought the assessment books during BookFest 2016 and was eager to let DinoBoy start on them. However we weren't able to do so because of the school work load, by the time he finishes his homework he don't have time to finish any assessment assignment. Solution - #30minrevision to the rescue! This was originally shared by Mama Christy from Kids 'R' Simple, she did bite size 30 mins revision with her girl and it worked well! So I am following her foot steps to do this daily after dinner, 30 mins, no more nor lesser than that. We will be sharing more about this later but do find snippets of our revision with our kids in Instagram with hashtag #30minrevision. DinoBoy's verdict - He likes that it only lasted 30 mins, not too short but long enough for him to finish a section of assignment. He feels that night time is more relaxed and he can sleep better too. Yes, we survived P5 Term 1 but not without sustaining some bruises and cuts, we will take this as a learning period to better ourselves in order to breeze through the rest of the year effortlessly. I always remember to tell Dinoboy this after our hugs and kisses at the school gate. For PSLE kid, hop by to Kids 'R' Simple and catch Mama Christy's PSLE Series posts. If you are looking for extra resources to engage your child in learning or tips on handling school work, head over to Mama Sue's Primary School posts. To get great tip on studying guides for all primary levels, hop by to Universal Scribbles and read Mama Meiling's useful Study Skills posts. Remember to follow us on instagram din0mama and kidsrsimple to catch snippets of our daily #30minrevision with our kids. Dumpling will be mature and positive too! You also hang in there. You have always been doing loads with her and her schoolwork has been a lot since P1, I am feeling your tiredness now :( We both add oil!